Winter outdoor adventures are wonderful, but avalanches are a danger we must consider when trip planning. 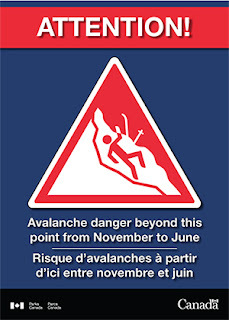 Did you know avalanche season is from November until June in the Canadian Rockies? If you do not have avalanche skills training, I strongly encourage you to stick to official winter trails that do not cross avalanche paths and consider taking an avalanche skills course. 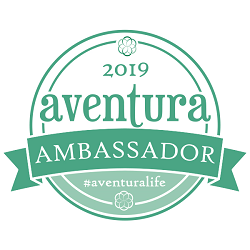 Our local parks have winter trails for hiking, snowshoeing, cross country skiing, and fatbiking that are in simple aka Class 1 terrain where the avalanche risk is typically low (in low avalanche danger conditions). Low risk does not equal no risk. Some official winter trails cross avalanche paths! Other Class 1 / Simple Terrain trails end right before dangerous features (cliffs, large avalanche slopes) so you need to carry a map and know where to turn back. For example, if you snowshoe to Fairview Lookout, you must stop at the lookout and return the way you came. The summer loop beyond the lookout is NOT safe in winter as it passes through a major slide zone. You should always research your route for potential hazards (avalanche slopes, gullies, cliffs, cornices, etc.) and check the Avalanche Report* at Avalanche Canada before heading out. Danger levels are reported from 1-Low to 5-Extreme. See the Avalanche Danger Rating Scale here: Avalanche Canada - Avalanche Danger. Avoid ALL avalanche terrain when avalanche danger is Extreme/High! *Avalanche reports will be available daily from November 23, 2017 on. 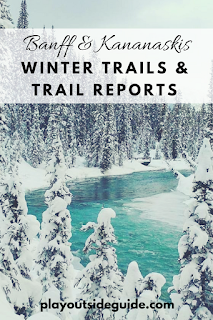 Here are the official winter trails and trail reports for Banff National Park and Kananaskis. Click on bold subheadings to visit Parks Canada pages. Winter Trails in the Banff Area: Note there are infrequent avalanche paths on Spray River Trail and Redearth Creek. Check out our trip reports for: 4 Fall/Winter Hikes in Banff and Stoney Squaw Summit (hike or snowshoe). Winter Trails in the Lake Louise Area: Read trail descriptions carefully as it is easy to get into avalanche terrain in Lake Louise. 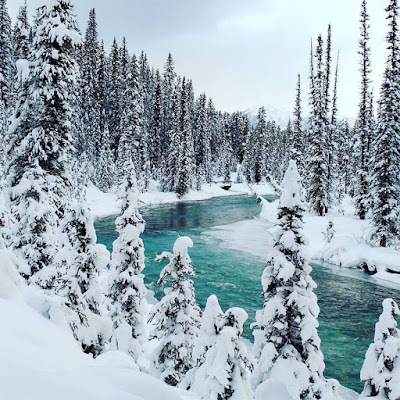 Some winter trails we enjoy in Lake Louise include: The Best Beginner Cross Country Trails in Lake Louise, Pipestone Cross Country Ski Trails, and Fairview Lookout Snowshoe Trail. Bow River Loop is stunning! Heed these signs for your safety! Cross country ski trails: Go to AB Parks - Kananaskis Country - Trails and search "skiing". Note that "backcountry" ski trails are not groomed. Trail networks: There are great networks of groomed cross country ski trails at Canmore Nordic Centre ($), Mount Shark, Kananaskis Village, Peter Lougheed Provincial Park (start at Pocaterra, Boulton Creek, or Elk Pass), and West Bragg Creek. Skate skiing: Canmore Nordic Centre is best for skate skiers. Warming Huts: There is 1 warming hut at Pocaterra, Peter Lougheed Provincial Park. Canmore Nordic Centre has a large lodge with showers and cafeteria as well as a warming hut 2.6 km from the lodge. Peter Lougheed Visitor Centre serves as a good place to start with exhibits, weekend programming, washrooms, and kitchen. 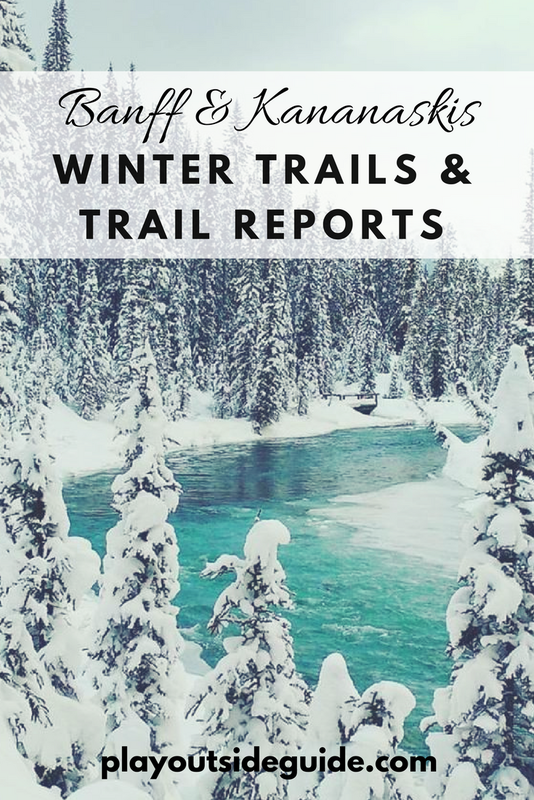 Trail recommendations: My story Falling for Winter: Winter Activity Guide for Calgary & Area lists many of our favorite nordic ski trails (as well as places to snowshoe, skate, and downhill ski). Fatbiking trails: Go to AB Parks - Kananaskis Country - Fatbiking. 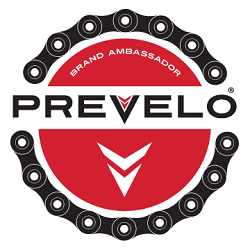 West Bragg Creek and Canmore Nordic Centre have large trail networks for fatbiking. Hiking trails: Go to AB Parks - Kananaskis Country - Trails and search "year-round" or "winter" and look for the hiking icon. Bow Valley Provincial Park, Elbow Valley, and Sibbald Flats have several hiking trails you can do year round. Snowshoe trails: Go to AB Parks - Kananaskis Country - Trails and search "snowshoe". These trails are in Simple / Class 1 terrain. Spray Valley and Peter Lougheed Provincial Park typically have the most snow compared to other parts of Kananaskis. Check out our favorite snowshoe trails in Where to Snowshoe Near Calgary. Note that some of the trails in the trail report are in avalanche terrain. For example, Burstall Pass is listed in the trail report, but is considered a summer trail (has avalanche danger in winter conditions). 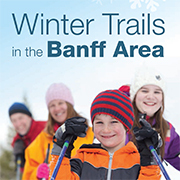 Go to AB Parks - Kananaskis Country - Trails and search "winter" or "year round" for lower risk options. If you are unsure of what trails have avalanche risk, please call the Kananaskis Information Line at 403-678-0760 or ask at a Visitor Centre. Click on the bold subheading links below for Kananaskis Trail Reports and advisories - by region. Bow Valley: Note that Bow Valley Park Road (past Middle Lake) is closed mid-October - April 30. There are lots of year round trails in the park and Willow Rock Campground is open year round. 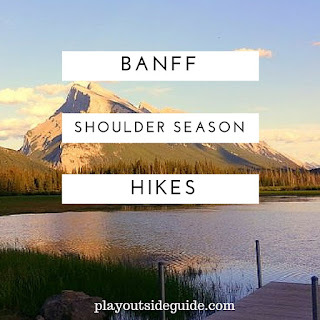 Check out my Bow Valley Provincial Park Camping and Hiking Guide for more information. Canmore Nordic Centre: Cross country skiing trail fees are in effect until 5 pm daily; fatbiking, ice skating, and snowshoeing are free. 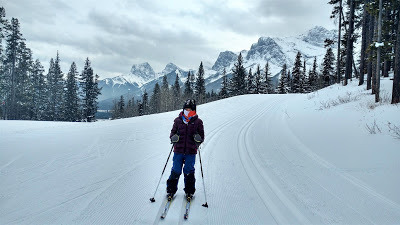 For more information, see my stories: Cross Country Skiing at Canmore Nordic Centre and Why You Need a Canmore Nordic Centre Season's Pass. 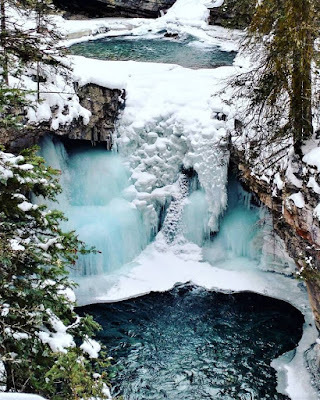 Canmore and Area: There are several winter trails in the Canmore area. 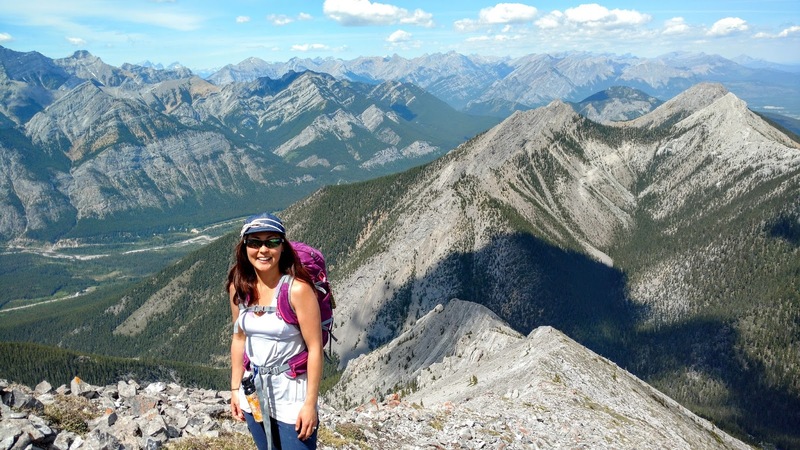 Mount Grotto, Ha Ling Peak, Miner's Peak, and Lady MacDonald are NOT winter trails. Wear crampons or microspikes on the Grotto Canyon Ice Walk and stay back from the ice falls as chunks of ice often break loose. Elbow Valley: Note that the Highway 66 winter gate near Elbow Falls closes from December 1 - May 14, & Powderface Road is closed December 1 - May 14. Fullerton Loop (6.8 km, 365 m gain) is a popular year round trail. Prairie Mountain is an unofficial trail that is hiked throughout the fall and spring. Proceed at your own risk. Glenbow Ranch: Year round hiking just east of Cochrane. Tiger Lily Loop (2 km) is a fun one to do with kids. Kananaskis Valley: There are several cross country ski trails and snowshoe trails here. Please observe the turnaround point for Ribbon Creek Snowshoe Trail. Significant avalanche danger exists beyond 3.3 km. Peter Lougheed Provincial Park: Note that Highway 40 is closed from just past Kananaskis Lakes Trail to Highwood House Junction from December 1 to June 14. Sheep and Highwood: Note that Highway 40 is closes from just past Kananaskis Lakes Trail to Highwood House Junction from December 1 to June 14. Sibbald Flats: Year round hiking down Highway 68. Deer Ridge and Jumpingpound Loop are popular trails. Spray Valley: The Spray Valley gets tons of snow so it's a great place to snowshoe and cross country ski. Mount Shark has several groomed cross country ski trails. Chester Lake is a popular place to snowshoe or backcountry ski (note there are separate ski and snowshoe trails and the ski trail is not groomed). West Bragg Creek has great cross country skiing and fatbiking. A lot of trail maintenance is done by volunteers. Donate to the Greater Bragg Creek Trails Association if you like what you see. Donate here. 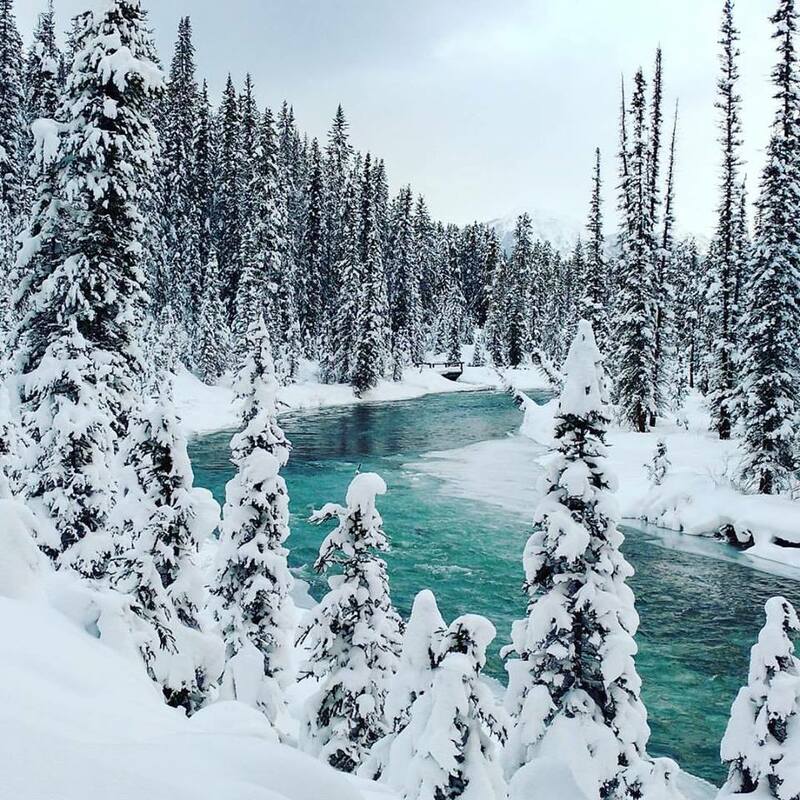 Here are some ideas for winter outdoor fun near Calgary! Winter Activity Guide for Calgary & Area: where to ski, cross country ski, snowshoe, sled, and ice skate!